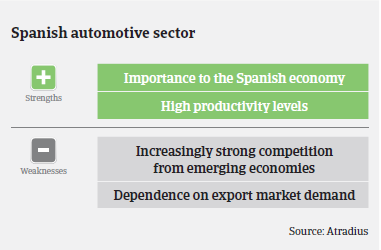 Like other Spanish industries, the automotive sector was hard hit by the economic crisis, as lower domestic consumption and difficulty accessing financing led to a slump in the car market. The Spanish automotive sector is strategically very important for the country’s economy, as it accounts for 10% of the Spanish industry sectors´ share of GDP and 9% of employment. It also accounts for 12% of Spanish exports an 4.9% of imports. Spain is still the second largest car manufacturer in Europe, behind Germany, and ranks number 9 globally. 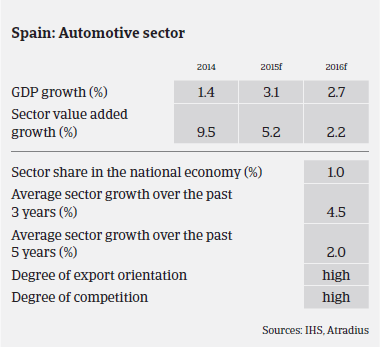 Like other Spanish industries, the automotive sector was hard hit by the economic crisis, as lower domestic consumption and difficulty accessing financing led to a slump in the car market. However, a rebound began in 2013 and accelerated in 2014, in line with Spain´s and the Eurozone´s economic recovery. According to the Spanish car manufacturers association ANFAC, domestic car production increased 11% year-on-year in 2014, to 2.4 million units. In the passenger car segment, production increased 8.8%, to 1.87 million units, while commercial vehicle production increased 19.7%, to 530,900 units. This upswing continued in the first four months of 2015, with car production increasing 12.5% year-on-year. Exports became the mainstay of Spain´s economic recovery, and in 2014 two million cars were exported; up 8.5%. 85% of cars made in Spain are destined for export, particularly to the EU, which accounts for 74% of Spanish car exports. Due to the economic crisis domestic demand for passenger cars had decreased dramatically: from 1.7 million vehicles registered in 2007 to fewer than 0.8 million in 2012. However, the sector has benefited from the domestic economic rebound that started in 2014, as new vehicle registration grew 4%, to 987.281 units. This recovery has gained momentum in 2015. In line with the forecast for solid performance of the Spanish economy, which is expected to grow 3.1% in 2015, and a strong recovery of domestic household consumption in the January 2015 - July 2015 period, new passenger car registrations increased 22.3% year-on-year. The outlook for the remainder of 2015 and into 2016 remains optimistic, given the expected Spanish GDP growth rate of 2.7% next year and forecasts for further acceleration of economic growth in the Eurozone (1.5% in 2015 and 1.7% in 2016). Spanish car production is forecast to increase to about 3 million units in 2017. While external financing requirements and gearing are generally high in this sector, banks are increasingly willing to provide credit to this industry. Profit margins are expected to remain stable in the coming 12 months. Payments generally take about 40 days on average, and payment delays have decreased in H1 of 2015. The same accounts for automotive business insolvencies, which are expected to decrease further in the coming months. 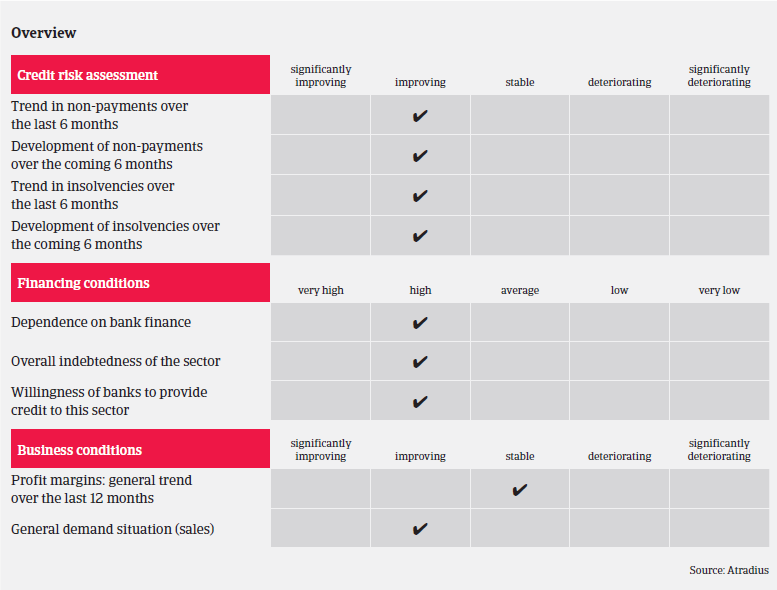 Overall, it is expected that Spanish business insolvencies will decrease 20% in 2015 after a 30% decline in 2014. However, this would still leave business insolvencies at a high level compared to the pre-crisis figures before 2008. Due to the rebound, our underwriting stance for the automotive sector has become more relaxed than in previous years. There are no major restrictions in our underwriting stance for large companies and strong international groups. However, we are still more cautious with small and medium-sized automotive companies that are highly geared.